This is a stripper deck (not marked). As you know many effects are possible thanks to this deck. 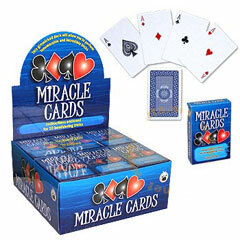 Show a deck of cards to a spectator and have him shuffle it. Take back the deck and instantly pull out the four aces. Your spectators won't believe their own eyes! A Best Seller in card magic. • Finally at an unbeatable price. • These cards' back is the same as the Svengali deck and the Everyday - Playing Cards. This will allow you incredible performances by switching the decks. • Comes supplied with instructions for 10 effects.